Tel Aviv-based virtual container security startup Aqua Security raised $25 million in Series B funding, bringing the company's total equity funding to $38.5 million, the company announced Tuesday. The round was led by Menlo Park, California-based Lightspeed Venture Partners, with the participation of previous investors Microsoft Ventures, Tel Aviv-based venture capital firm TLV Ventures and Israel-based technology entrepreneur Shlomo Kramer, founder of Check Point Software Technologies and Imperva. 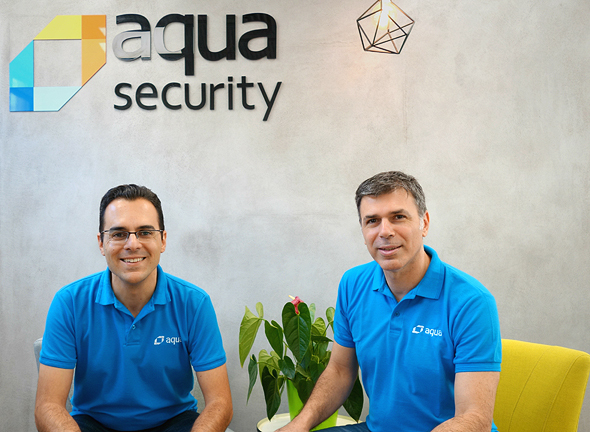 Established in 2015 by Amir Jerbi and David (Dror) Davidoff, Aqua Security combines machine learning and threat research to offer an advanced security service for container-based applications. The company currently has 60 employees in Tel Aviv, Boston and San Francisco, and is planning to use the current funds to expand its research and development center in Israel. "The market is undergoing a substantial change currently, providing us with a unique opportunity for growth," Mr. Davidoff told Calcalist. "We have the initial advantage and most of our competitors are young startups. Once the big companies see that there is a large market, they'll enter it as well." "Over the last two years the trend of deploying to the cloud has accelerated greatly, and containers have become a fantastic tool," Mr. Davidoff added. "But if once upon a time security was something you did after product development, today it's being integrated during the first stage."